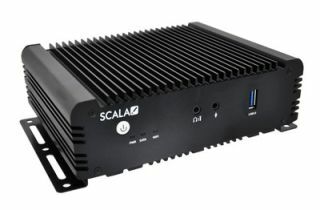 Scala announced the addition of Scala Media Player hardware to its digital signage portfolio. The addition of Scala-branded players gives customers a comprehensive, end-to-end solution to create, deploy and manage digital networks in a more streamlined way. Scala designed the players for optimal performance according to market needs, and will draw on the experience and expertise of parent company STRATACACHE to develop and distribute the new media player hardware. The new software and hardware solution eliminates the complexity of managing and deploying content to a diverse digital signage network, and supports ongoing growth. "Using Scala experts' extensive knowledge of the digital signage ecosystem - with decades of experience and best practices - we created media players that are designed for performance, stability and capability," said Chris Riegel, CEO at Scala. "Our focus is to help customers meet their goals faster and smarter, taking the guesswork and risk from choosing the right media player, so they can focus on driving a successful visual communication strategy." In order to suit the range of customer specifications for performance, Scala plans to introduce a number of additional configurations of the Media Player. These variations highlight Scala's dedication to helping its customers achieve successful deployments as a full digital signage solutions provider. "Scala Media Players are designed from the ground up to deliver optimal hardware and software integration and performance," said Joe Sullivan, COO at Scala. "Having access to STRATACACHE's knowledge of hardware and logistics facilities was key in allowing us to develop and deliver a media player that would meet the needs of our customers."